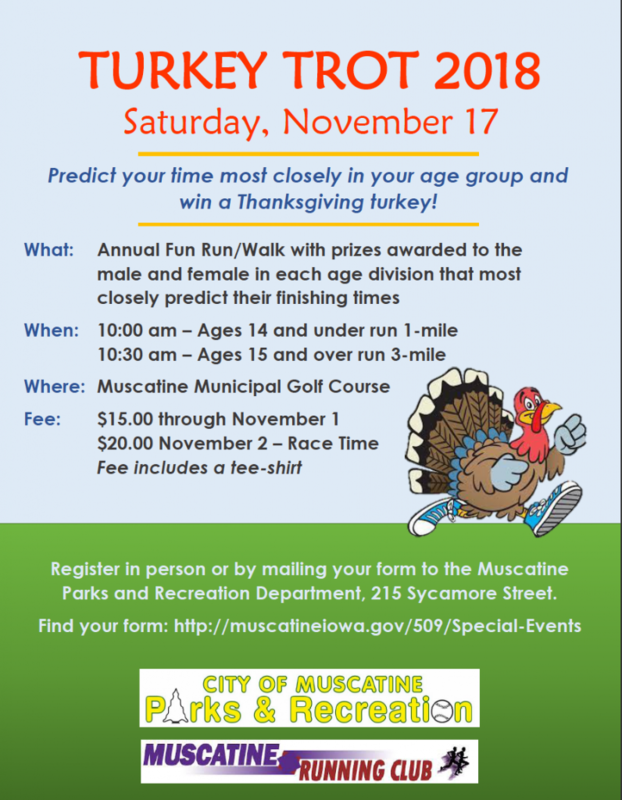 Description: Hustle your way to Thanksgiving dinner at the 2018 Turkey Trot sponsored by the Muscatine Running Club and the Muscatine Parks and Recreation Department. The Turkey Trot Fun Run/Walk will be held on Saturday, November 17 at the Muscatine Municipal Golf Course. Ages 14 and under will run their 1-mile race starting at 10:00 am and ages 15 and older will run their 3-mile race starting at 10:30 am. The male and female in each age division that finishes most closely to their predicted finishing times will win a Thanksgiving turkey!